When I was a little kid, maybe six years old, my dad’s brother and his family moved in with us temporarily. All told it was only a period of about nine months, but my memory has stretched this visit out into something far more mythic. Along with close quarters bonding time with my extended family, something else important happened during that period – my first comic book. My uncle was an old school comic geek; an original Silver Age gangsta. My grandparents’ house had burned down in the late seventies and my uncle has always lamented the meticulously cared for first edition comics from the 60s that he lost in that fire. Even so, when his family moved in with us years later, he was still reading comics. 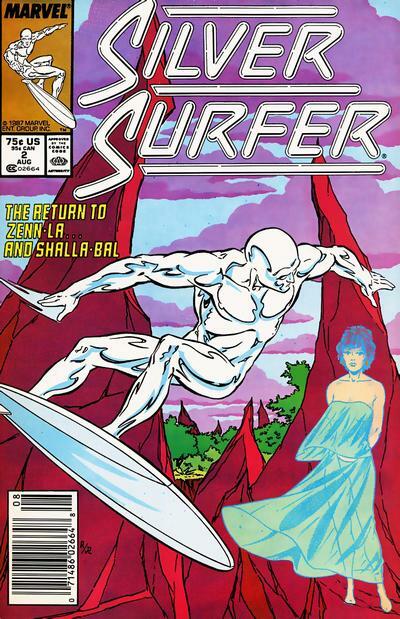 Perhaps I had seen a comic before then or even looked through one, but the first one I can really remember is Issue #2 of the Steve Engleheart/Marshall Rogers Silver Surfer run. I remember it in vivid detail because my uncle and I sat together and he read the whole thing to me out loud. He acted all the parts, from the Silver Surfer himself to his erstwhile lover Shalla-Bal, and he vocalized the crackle of the sound effects as the Surfer used the Power Cosmic to glide through the cosmos at light speed. He took this two dimensional thing and he brought it to life right in front of me. Later on I would learn from Scott McCloud (who wrote the insightful Understanding Comics) that this was wrong – that comics are meant to be a visual medium, drawing power from the silent interplay between images and the written word. And yet there had been something about my uncle’s bombastic reading that captured the true spirit of the thing. It illuminated that Silver Surfer comic to such a degree that it felt like I was experiencing it in its purest form. Scott McCloud can call me a philistine if he wants. That was the moment that the comics medium was grappled to my soul with hoops of steel. I’ve read a lot of comics between now and then, but Gideon Productions’ raucous staging of the comic Kill Shakespeare at HERE Arts Center is the first time I’ve been able to truly relive that deep-rooted primordial joy of hearing a comic read aloud. 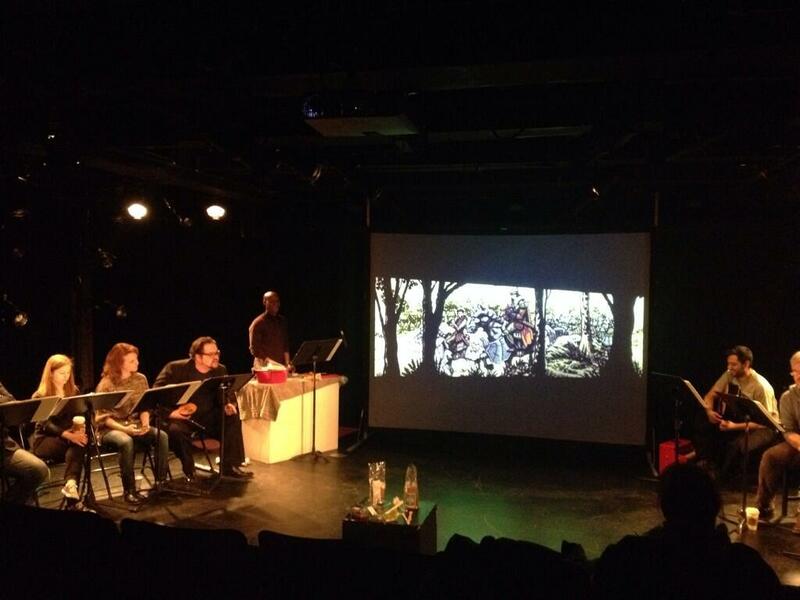 Certainly much of the shows success can be credited to Anthony Del Sol and Connor McCreery’s smart adaptation, which reconfigures their already engaging comic into a kind of dramatized PowerPoint presentation. But the truly endearing thing is director Jordana Williams’ chill staging, which opts for a laid back, messing-around-with-instruments-in-the-dorm-room atmosphere to tell this crazy story about Hamlet’s quest to meet (and possibly kill) his maker is told. 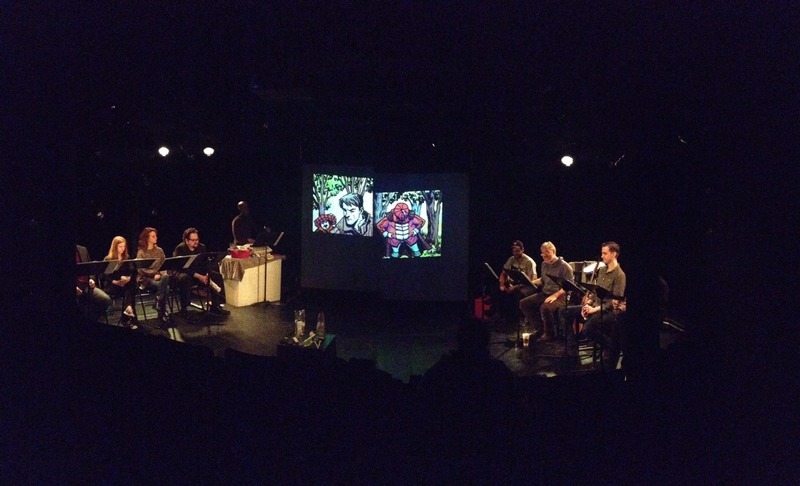 Here’s the way this inspired set up works: the nine-person ensemble sits on either side of the stage at music stands, with a large projection screen in the middle. 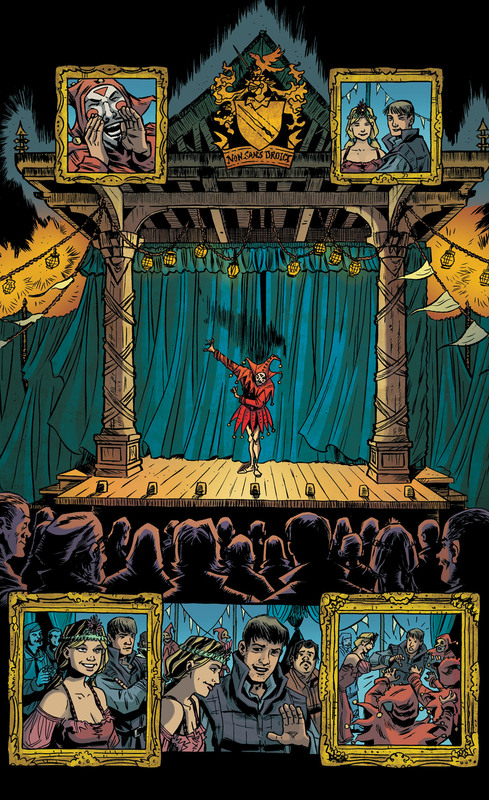 Projections of Andy Belanger’s evocative artwork from the Kill Shakespeare comic flit across the screen and the actors speak the dialogue that existed previously as word balloons (which have all been removed here). When an image of a roaring campfire appears onscreen, Lead Foley Artist Daryl Lathon crinkles together plastic wrap to simulate the popping; in fact the entire cast has been equipped with metal objects to clang together so the big battle scenes can be experienced in sensurround. Cast member Neimah Djourabchi and Gideon Executive Producer/performer/polymath Sean Williams use guitars, drums, and even an accordion to provide some dope incidental music. The whole thing is invitingly casual – when the house opens the performers are just hanging out and happily greet audience members as they enter. Given that the cast is made up of folks who have been affiliated with Gideon for a while in one way or another, you feel like you’re being initiated into the inner circle of an established group of very cool friends. In my Pre-Game for this – which Sean Williams hilariously called an act of “exegetical archeology” on Facebook – I covered a lot of the key plot details for the comic Kill Shakespeare, so I’ll spare everyone another full synopsis here. Suffice to say that the story is an able mashing-up of the most famous Shakespearean characters and the most epic comic book tropes. Hamlet, on leave from the events of his own play in Denmark, must wander the English countryside in search of the reclusive wizard William Shakespeare. The evil King Richard III wants Hamlet to kill Shakespeare; the crusading revolutionary Juliet wants Hamlet to restore the Bard to power. Along the way, Hamlet teams up with or faces off against a veritable who’s who of Shakespeare’s works: Falstaff, Iago, Othello, Don Jon, Romeo, Puck, Lady Macbeth. Even Feste from Twelfth Night pokes his head in. 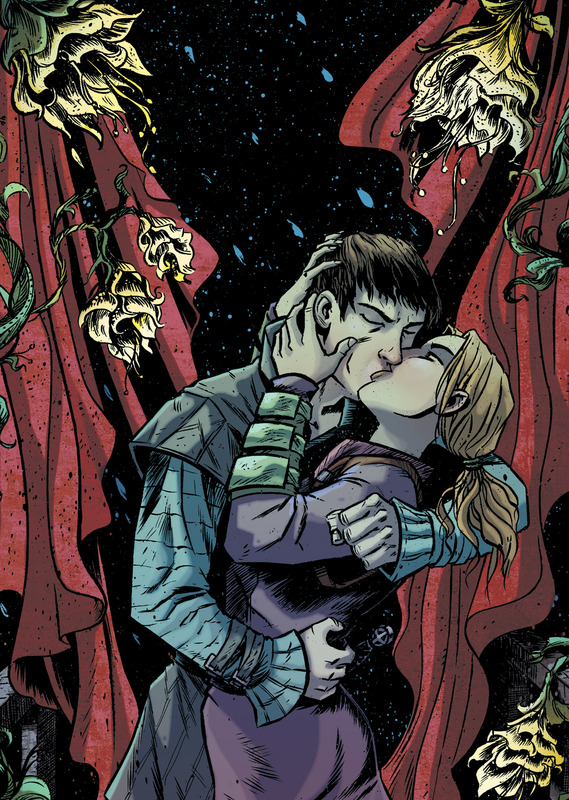 I only read the first six issues before seeing this, but Del Col and McCreery have clearly tightened up their narrative for the purposes of the adaptation, cutting some extraneous characters and adding a few more zingers that monkey around with famous Shakespearean lines. (“Now is the winter of Hamlet’s discontent!”) In general the material is greatly elevated by the rambunctiousness of the performance, which always airs on the side of winking comedy rather than braving the well-trod path of the over serious and thus potentially lukewarm literary epic. I do have to geek out a little and play continuity hound with regards to the “Murder of Gonzago” scene, in which Hamlet sees the play-within-a-play from Hamlet reenacted by Feste’s troupe of players, and then flees in horror because it essentially depicts the murder of his father. Doesn’t this take place after Polonius’s death? And thus after Hamlet has already seen “The Murder of Gonzago” with his mother and uncle in attendance? Why would he be so freaked out by it? In fact, Hamlet actually rewrote “The Murder of Gonzago” especially for the Denmark production so that it would be closer to the circumstances of his father’s death and thus force Claudius to confess his guilt. How would this new version have gotten all the way to England so quickly? I realize that I am splitting hairs about a story where Shakespeare has the ability to project force fields, but when you invite Shakespeare into the realm of comics, you have to expect this level of fanboy outrage and obsession. And yet such asinine quibbles vanish within all the broad comedy, thanks in large part to the breakneck speed at which the projected panels of comic art flip by and the truly remarkable cast. In my experience the story of every play eventually becomes a kind of metaphor for the experience of producing, rehearsing, and performing of that play. Here, a story about assembling a dream team of Shakespearean characters is answered by production that must assemble a dream team of actors. Throughout, Djourabchi and Williams’ hilarious use of pop standards becomes almost like another layer of commentary on the material – the main riff from Led Zeppelin’s “Kashmir” scores all of Lady Macbeth’s scenes, for instance. The humorous disconnect is so steep that it feels impromptu, as though the Gideon gang was just hanging around right before the show one night and Williams said, “Oh, you know what I can play there? Led Zeppelin.” Again, the feeling of informality is welcoming rather than off-putting; it transmits the vibe that you are at a spectacularly fun party with a bunch of theater people messing around about Shakespeare and comics. In addition to the music he provides, Djourabchi gives an ingenious performance as Romeo by essentially impersonating Keanu Reeves. Djourabchi’s delightful line readings in Reeves’ melodiously bland style are probably intended as a very inside-baseball Shakespeare joke about Reeves’ notoriously lackluster performance in Kenneth Branagh’s film adaptation of Much Ado About Nothing, but regardless the gag is still very, very funny. Williams, who was so good in Gideon’s Advance Man, makes for an affably silly Falstaff. Likewise, Gideon resident playwright Mac Rogers’ purposely overblown Chorus readings and his Dudley Moore-ish interpretation of Shakespeare are consistently entertaining. Abe Goldfarb brings a repulsive volatility to Iago, and Foley maestro Lathon also pitches in as an apprehensive and resentful Othello. Brian Silliman’s final gurgling scene as the ruthless Richard III is an uninhibited bit of virtuosity, as is the sensual menace Kelley Rae O’Donnell lends her Lady Macbeth. Finally – I must retract a statement I made in the Pre-Game post, where I said that Del Col and McCreery’s comic succeed in part by fitting Shakespearean characters snuggly into comic book hero and villain archetypes. Maybe that does happen a little, but there is, in fact, a quite touching scene that comes about midway through the story, where Juliet reminds Othello that none of them are purely good or purely evil, saying “Will did not make us to be so simple as heroes and villains.” It’s a nice acknowledgement on the part of the writers that even though they have imported these characters into a comic, Del Col and McCreery understand that Hamlet, Othello, Juliet, and Iago are in many ways too complex, too large to be so easily contained by the conventions of any one story or any one medium – Shakespeare’s art has transcended even its own boundaries. But out past those boundaries, in a bizarre hybrid of the graphic and performative arts like this, Shakespeare’s characters can take on a new kind of visually kinetic substantiality; as Hamlet himself might say, this live version of Kill Shakespeare suits the action to the word and the word to the action, just like my uncle did all those years ago. Somebody should really tell that Scott McCloud guy. Sometimes you need to hear your comics read out loud. Sometimes you get a little more out of them that way. More than comics. More than theater. More than images. Gideon Productions’ staging of Kill Shakespeare ran through March 5 at Here Arts Center. For more information visit Gideon Productions.